You know, the one in the grocery store poring over her plastic organizer, pulling out her phone every five minutes, taking way too long to decide between Charmin and Quilted Northern. I’ve always been a bargain hunter but it wasn’t until I moved in with my boyfriend (and we decided I’d handle the groceries while he handles the utilities) that I took it to the next level. Yessir, we’re talking coupons. It started out simply enough. “Hey, there’s a coupon for that brand of hummus we like!” And I won’t say I’m one of those extreme couponers–I’ve made it a point to avoid the laminated binders–but I’ve definitely started to take it more seriously once I realized just how much there is to save. Once you start couponing, you realize what an idiot you’ve been for paying full price. Think about it: Why would you pay $9 for a bottle of laundry detergent when you can almost always get it for under $1, or even free? So, here we are. I’m the weird coupon lady that all my friends make fun of, and that all the people stare at in the aisles of Harris Teeter. And I’m OK with that, because I save a TON of money. I think there are a few really big misconceptions about couponing. One is that everyone has these insane stockpiles of products they’ll realistically never use. Another is that couponers end up buying really unhealthy groceries–Hamburger Helper or Jimmy Dean sausages. The truth is, it is what you make of it. I try to eat pretty healthily (OK, I’ll admit I throw a pint of gelato in the cart every now and then). 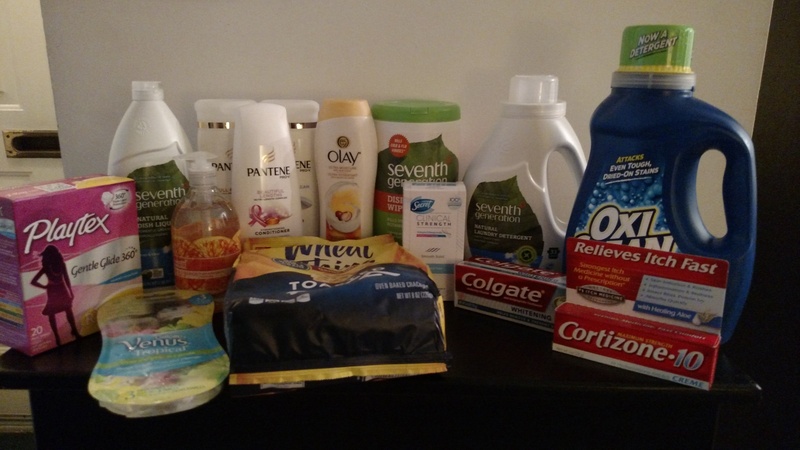 I rely on coupons to minimize the cost of toiletries, cleaning supplies and other household essentials so that I’m left with a lot more money to buy fruits, veggies, meats and other fresh foods. This week is Super Doubles at Harris Teeter. HT usually doubles coupons up to $1 (meaning a $.50c coupon becomes $1, $.75c becomes $1.50, etc. ), but on Super Doubles week, coupons are doubled up to and including $2. So if you have a $2 off coupon, it becomes $4 off. It’s pretty much a feeding frenzy for my kind of people. If you’re curious about couponing, The Krazy Coupon Lady offers a much better guide than I could ever write. Once you read that and learn what a “matchup” is, click over to Southern Savers for a great weekly guide to shopping Harris Teeter’s sales. In the meantime, let me show you the best of my scores this week. VIC sales are the usual Harris Teeter deals you get by giving your Harris Teeter card; eVIC sales are Harris Teeter deals you get by signing up for their online sales site; coupons are mostly from coupons.com with a few Red Plum/newspaper coupons mixed in; iBotta rebates are from an app that gives you cash for buying certain products. Not pictured deals include Energizer batteries ($4.99 to $.40c), a banana (free), Wholly Guacamole ($2.99 to $.99) and Angel Soft toilet paper ($6.75 to $2.97). Super Doubles continue through midnight on June 30. Click over to Southern Savers to see what kinds of deals you could get this week.